It’s time to officially kick off the 90 Riders in 90 Days Sponsor a Rider campaign. 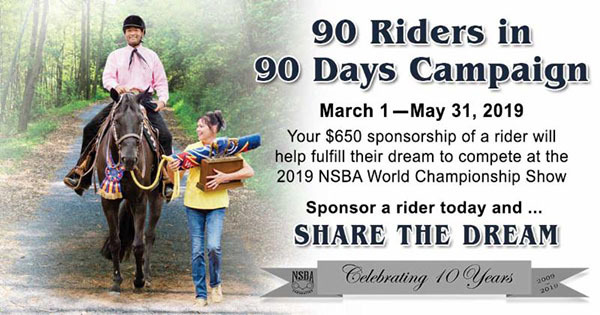 Each year, the NSBA Foundation provides grants to Equestrians With Disabilities and Veteran riders to attend the NSBA World Championship Show. Your $650 donation to this campaign makes dreams come true for riders who otherwise would not have the opportunity to attend a World Championship Show. Share the dream and donate today.